I noticed that no one had made of post today. High temp in Ely today 64....only 32 degrees above freezing. i got the strange look when I took my otter in to get a few seams fix and added some pockets. All I said is that I could be using it anyday now. You can only hope. Did firing up your auger help chase the mosquitos away any? If that will help, I'll get mine out of storage and gas it up! I also got all sorts of little ice fishing related projects going on right now. From my Otter sleds to my tackle boxes and in a few weeks, my permanent shack. I tried my auger today to help with the bugs, didn't work. How fast do you have crank the handle to make a difference? The other day I had to mow the lawn. So, as long as I had the mower running, I started the auger, snowcat AND the snowblower. I'm sure my neighbors think I'm nuts. Wait till they see me doing that this fall with the new ice house and the portable set up in the garage too. Is it just me, or do the rest of you point out good ice fishing spots every time you're on the open water fishing? I'm always keeping mental notes when I'm out in the boat..."This has got to be a good spot for ealry ice crappies", or "I know we could find some walleyes here come first ice", middle of summer and I'm thinking ice fishing ... I love it! As a matter of fact... no, it didn't chase any of them away. But it did stop them from biting for a few minutes. I think it made them a bit jealous since my "stinger" was bigger than there's... LOL!!! Matt, my folks just got a summer cruise of all my ice fishing spots of last year! They wanted to go look at cabins and I was like, " here's where I got the Walleyes, check out that cut, you can see where the Gill's were stacked. This deep hole held numerous Whitefish. Crappies were holding good in this deep mud here also!! " The co-workers just scolded me also for bring up the ice season!! Bring on the ice!! I fired up the auger last week, and bought ice fishing tackle over the weekend! Oh thank God! I'm not the only one afflicted with this illness. 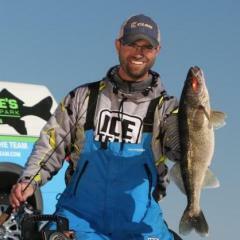 Whenever I'm fishing open water, all I can think of is how I can't wait for first ice! The other day I respooled a few tipups, and reorganized my panfish jigs for the 20th time. If I could afford it I'd move to the southern hemisphere in April and come back in time for deer huntin and ice fishin. Anything over 70 is too hot to do anything, under 32 it's time to fish. Good for you Bigfish JZ. 😎 That’s a situation I can’t even comprehend. I’m one of the 50 hour/week crowd. 5 weeks of vacation built up doesn’t really mean a thing.